w00t! I finished it! And bashed my finger with a hammer while affixing the hanging rod to the wall, so it’s painful to type. Other than that, no injuries. 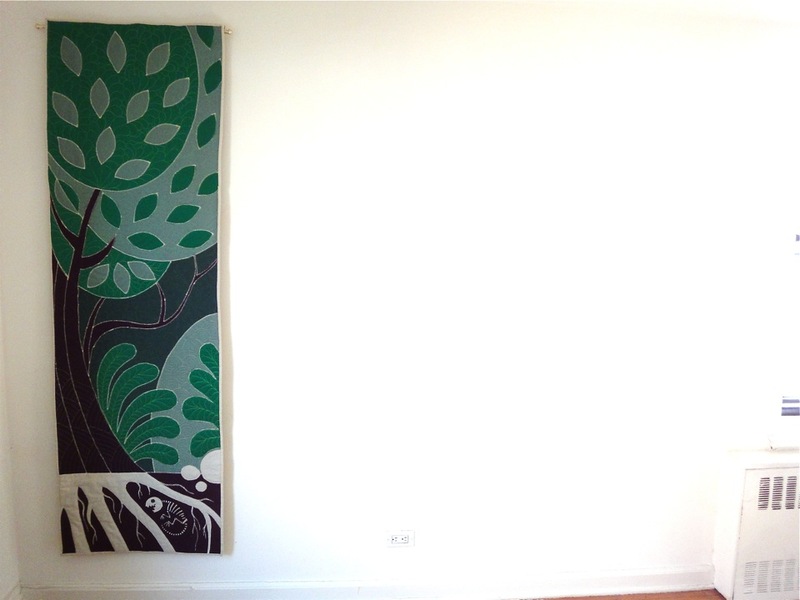 I present photos of my second-and-a-halfth quilt, “Earth,” which will hopefully be joined by the 3 other elements if I don’t crash out of my new sewing obsession before I make them. It’s a whopping 24.5″ by 79″. That’s almost 2,000 square inches! My wall is now one-fourth less sad and empty! One down, three to go. This is what I made it with (except I hand-sewed the binding on the back this time). I love this sweet little machine, but I want something a little larger now. I’m upgrading to one with 50% more “harp space,” so I’ll probably be selling this one soon. I no longer have the box (can’t afford to store boxes in my small NY apartment) so I can’t ship it, but if you’re in NY and want it, drop me a note. Love it! Maybe it’s because I just re-read the post this weekend, but witnessing your process made me think of your content as water metaphor on Questioncopyright.org. I’m not sure that containers “increase the value of content”. More often than not, I think it’s the other way around. If the quilt fabric is the container, and the creative talent you “put in it” is content/culture, don’t you think that (at least in this case) content increased the value of the container? I know the Understanding Free Content article focused on digital content, but I’d feel the same if your design was digitized, then printed on some rare paper or with sandstone in a 3D-printer. I’d still see what you did as the real added value. Thanks for sharing, and I hope your finger heals quickly. DRAT you for dumping the box! I would so love to buy it, but no plans to go to NYC soon. I wonder if I know anyone driving down… Maybe you can get a box and shove it full of old styrofoam and bubble wrap? Don’t you have a ton of that sort of thing from the book-shipping DIY days? (gotta admit quilts are easier to mail! )… I WANT YOUR SEWING MACHINE! @Joshua: of course! My originals won’t have any value unless people see copies of them. Nina, please, pretty please read Jorge Luis Borges'”Pierre Menard, Author of the Quixote” in Collected Fictions, translated by Andrew Hurley. It’s the perfect story to illustrate some of the points that you were trying to make about copyright. 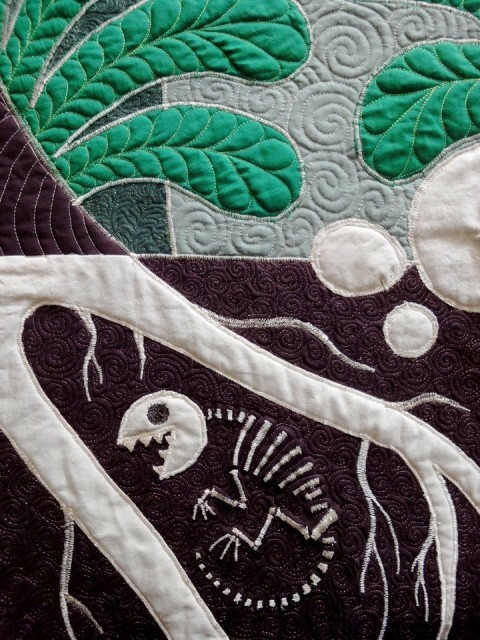 That is among the coolest quilts I’ve ever seen, seriously. I have dabbled in quilting myself and I thought I was learning quickly, but apparently not! BTW, I love binding, it’s my favorite part. My second quilt was mostly binding. 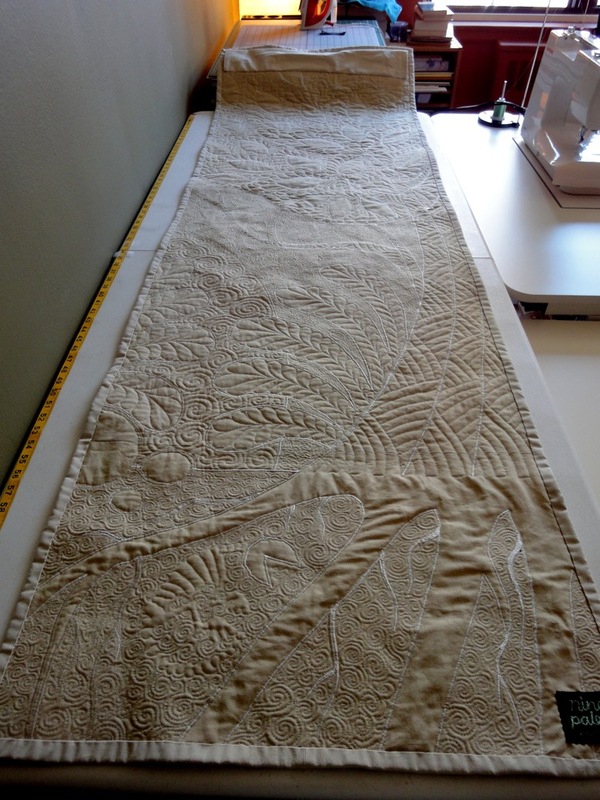 Very beautiful work, Nina…and the fossilized critter is the best touch! What a fantastic work of art!! I was in the women studies class that you gave a Skype lecture to the other week. I’ve been really inspired by your work with the copyleft movement. I work for a website called examiner.com and I wrote this article about it. Awesome job with the quilts. They look great. Incredible work! I’m so excited to find your blog! I ran across your comic strips at the Cartoon Art Museum in San Francisco last year… great stuff. I wish I had known about your work when I was at UIUC. Keep up the the great creative work you’re doing. The fossil in the Earth tapestry reminded me of the bones in the Earth-themed sections of Alan Moore’s and Tim Perkins’ element-structured “Highbury Working” record: 1) Lady, That’s my Skull and 2) Skeleton Horse (http://www.youtube.com/watch?v=zdMHAipa_qs and http://www.youtube.com/watch?v=SfK5bZRcKGA). Checked them again and there’s not much resemblance – his work is all skeleton, with only a drab dying London suburb to talk about, and not much about life – but I found those sections on Youtube and they’re still good so although irrelevant (impertinent?) I have to post this anyway in case you choose check them out and then go so far as to like ’em). Your tapestry is powerfully about glorious life so a humble thank you for creating it. I have recently discovered your work and I love it! 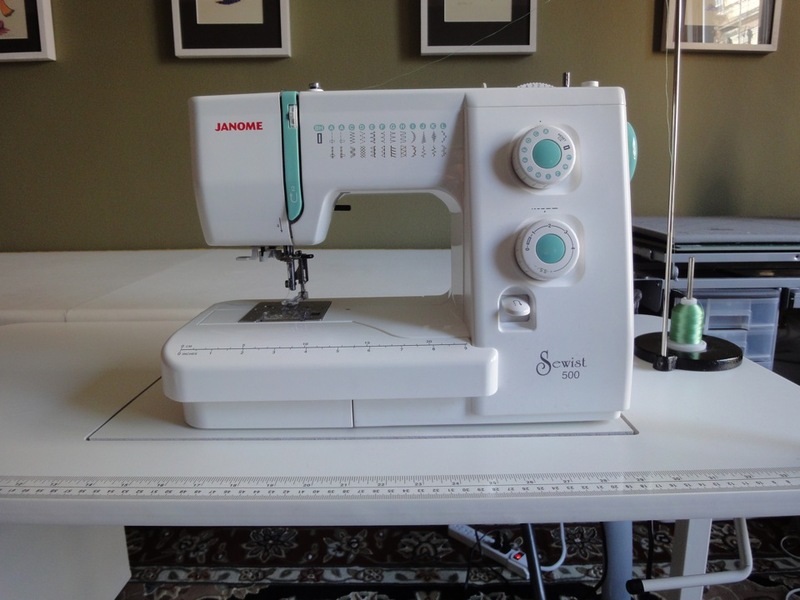 I know its a long shot, but if you still have the old sewing machine I would love to get it from you. I love this series. What a beautiful quilt. 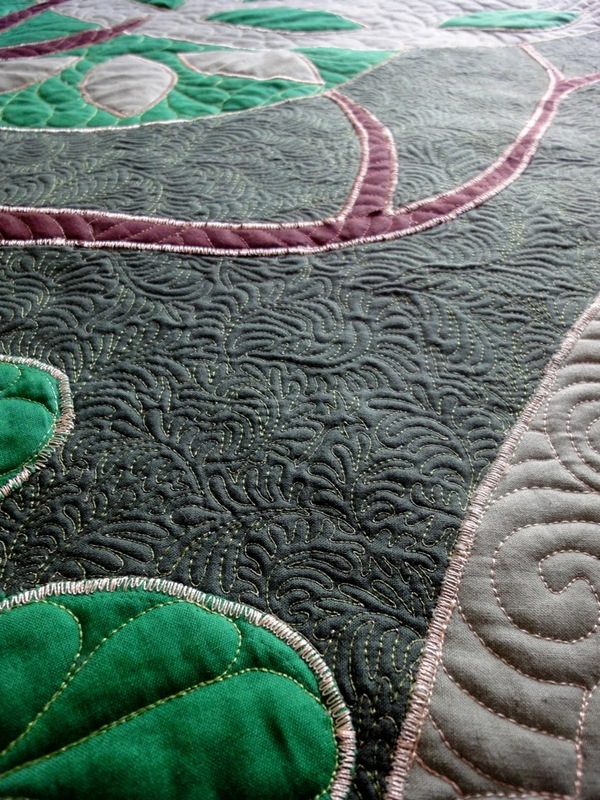 The “ferny foliage” quilting is amazing. 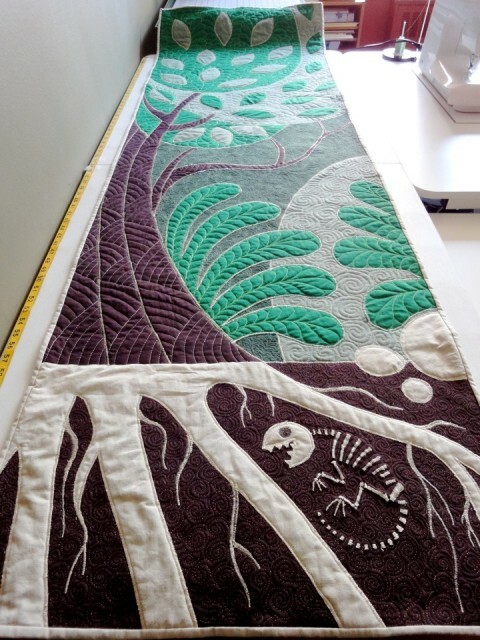 And the little critter skeleton in the roots of the trees is a really clever touch. Ms. Paley, you are some other kind of awesome altogether. Honestly, the copyright stuff gets boring for someone who lives inside a basement (metaphorically), but seeing beautiful art like this always makes a great start to my day!